5 ways to wear pink and look sophisticated. How do you feel about pink: Do you love it or hate it? While we’re a tad partial to this femme hue, we do understand why some shy away from the shade, especially those whose signature style doesn’t scream girly girl or flirty and frivolous. But times are a-changing. While pink has traditionally been associated with all things feminine and froufrou, designers have upped their game over the past few seasons and given the hue a modern makeover, which has seen it fast become a fashion favourite – not just with ladylike types but minimalists, androgynous dressers, fashion rebels, and the cool, casual kids, too. Still not sold on the sweet yet sassy colour? Well, sorry to be the bearer of bad news, but it’s probably going to be #trending for the next few seasons, so there’s really no escaping the powerful pull of pink…for much longer, anyway. But we’ve got good news, too. It’s not just pastel pink and shocking neon tints that are bang on-trend at the moment, but every shade in between is getting a look in, too. So whether you prefer pink-tinged champagne, rosy blush or look-at-me fuchsia, you’ll have no problem finding a way to incorporate this en vogue colourway into your wardrobe this season. Promise. For those who still need a little nudge in the right direction, we’ve put together 5 outfits that prove that pink can be styled to suit any style. Go on, step out of your sartorial comfort zone, and give it a try. And for those who need no convincing when it comes to wearing this versatile shade…enjoy! 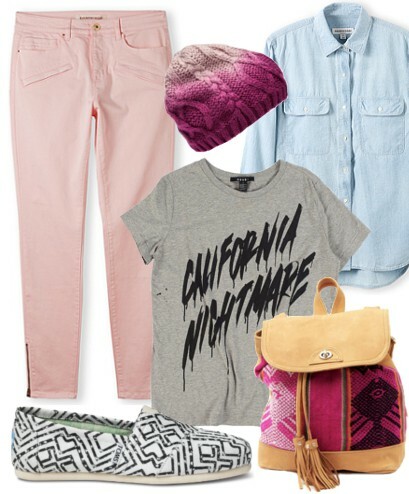 How do you plan of styling pink this season? Gorman Girl Saturday Jumper in Pink, $139; Little Joe by Gail Elliot No Stopping Silk Shirt, $329; SHEIKE Remedy Skirt $89.95; Pollini Patent Leather Pumps with Marbled Heel from Browns, £425; See by Chloe Large Duffle Bag from Shopbop, USD$595; BaubleBar Athena Tab Necklace, USD$46. 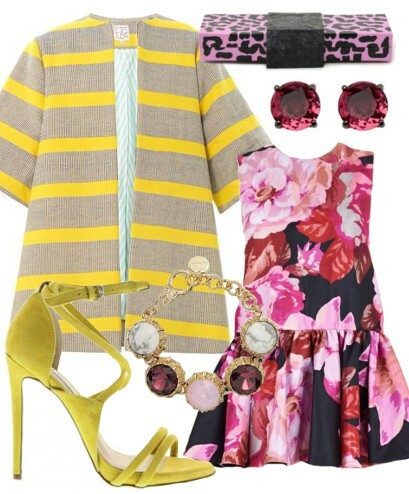 Trelise Cooper Lapel California Coat, $699; Topshop Seamed Textured Tunic, £46.00; Tony Bianco Trinity Heel in Bone Pearl, $139.95; Milly Rich Jacquard Shoulder Bag from Shopbop, USD$385; BaubleBar Day-Glo Garden Bib Necklace in Yellow, USD$54. Gorman Half Time Jacket, $489; ksubi Seduce and Destroy Muscle Tank, $69.95; J.W. Anderson Midi Sunray Kilt from Green With Envy, $885; Siren Shoes Goldie Leo Heel, $169.95; BaubleBar Gold Text Collar, USD$40; Marc by Marc Jacobs MMJ Slider Bracelet from Shopbop, USD$42. 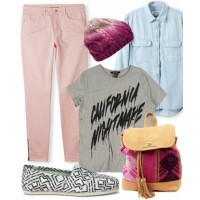 Country Road Crop Zip Detail Sateen Jean, $99.95; ksubi California Nightmare Tee, $79.95;Country Road Denim Shirt, $99.95; TOMS Womens Black Geometric Tie-Dyed Alpargata, $74.95; Sabrina Tach Inca Backpack and Shoulder Bag in Fuchsia from Boticca, $225.50; Forever New Brodie Ombre Beanie, $24.99. Stella Jean Olmo Stripe-Print Cotton Coat from Matches Fashion, £465; Cameo With Fire Dress from Zara Bryson, $199.95; Tony Bianco Alita Heel in Limone Kid Suede, $169.95; Susanna Valerio Pink Panther Clutch, $358.94; Mimco Hepburn Gem Wrist Bracelet, $149; Mimco Youra Stud, $69.95.